1) The Everleigh sisters were technically criminals, yet they genuinely believed they were helping the girls in the Club. What do you think about the Everleigh sisters’ business practices? Why were they so successful? 2) How are Minna and Ada alike, and how are they different? Who was the stronger sister, in your opinion? How were they able to perpetrate so many lies for so long? 3) In what ways does Abbott’s portrayal of turn-of-the-century America mirror the present day? 4) At the time the Everleighs ruled Chicago, what other choices did women have? Do you judge the women who became “sporting girls”? Do you judge the madams? What path do you think you would have chosen if you’d been alive and facing similar circumstances during the turn of the century? 5) On the surface it seems that there are only two sides in Sin in the Second City—the reformers and the sisters—but there are actually a few more: the politicians, the Levee gangsters, and the rival madams. Are there heroes in Sin in the Second City, and are there villains? Who did you sympathize with? Did you find your loyalties shifting at any point along the way? 6) Do you think the reformers exaggerated or accurately represented the “white slavery” situation? 7) At one point, the African America boxing champion Jack Johnson shows up at the Club, and his presence causes quite a commotion. What does his visit tell you in terms of race and America at the turn of the century? 8) How did America’s sexual culture change during the Everleighs’ reign? Who was primarily responsible for these changes, the reformers or the underworld? 9) Chicago is as much a character in Sin in the Second City as the gangsters and the madams. Why do you think the Everleigh sisters chose to settle in Chicago? Would they have been as successful in another city, or was Chicago particularly conducive to their success? 10) Many reformers cited strong religious convictions as a reason for fighting the red-light districts. How do you think the religious tenor of the times compares to that of today? 11) What was your favorite Everleigh Club anecdote? 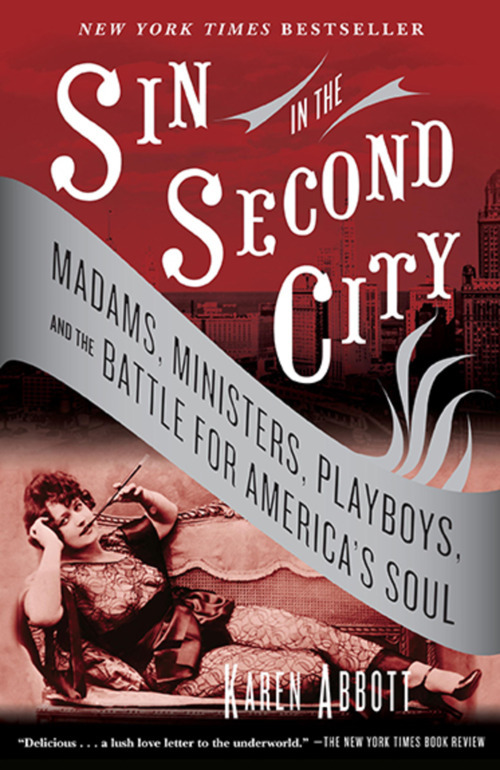 12) What satisfaction can be derived from a nonfiction book like Sin in the Second City that can’t be from novels? In what ways is the book like a novel? 13) Abbott stumbled upon the story of the Everleigh sisters while researching a long-lost relative. How much do you know about your own family’s history and ancestry? Do you know where they were and what they were doing from 1900 to 1911, when the Everleigh Club was in business?